What a couple of crazy weeks it’s been here in Merlin! The second major flood in two years has yet again threatened to destroy what remains of a beautiful old town. The main suspect is over-development of the area and consequent lack of absorption of rainwater. If I understand this correctly (and I may not have it all right), past flooding has been the result of rising waters from the Tiber River overflowing into the low lying Main Street. More recent flooding has occurred more from “top-down” – water that cannot soak into the ground due to uphill development of the land rushes downhill into the town. I do know that a number of businesses will not be able to survive two attacks and will either be closing their doors or moving to higher ground. A shame – the beauty of Old Ellicott City is the cluster of unique whimsical shops. I’ve known a number of people who travel there once or twice a year from all over the state to enjoy a day of shopping, lunch or dinner, and maybe even a ghost tour or two. 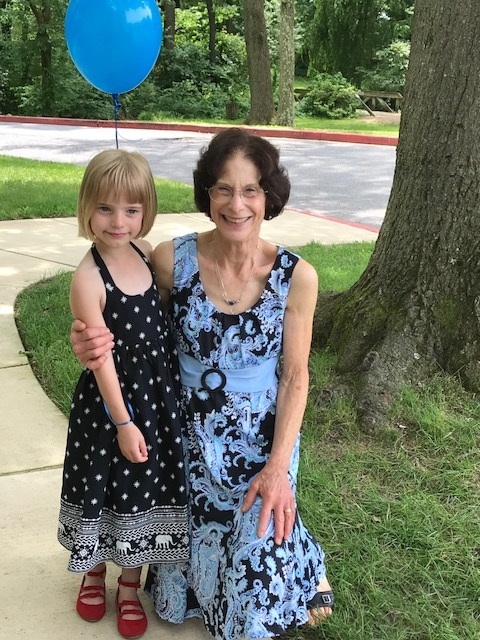 Friday, two of my colleagues covered my three cases and I took the day to attend granddaughter Patty’s Pre-K graduation. She and one of her teachers, “Ms. Jo,” are pictured above. I never met a sweeter person than Ms. Jo. She told me she’s been teaching nursery school for 26 years. She definitely has a heart for it. As each child crossed a little wooden “bridge” in the classroom, Ms. Jo put her hands on each child’s little shoulders and told all of us something unique and wonderful about each child. She really “gets” her students – at least I know she “got” Patty! “Where Patty goes, you will find a party.”Amen sister:)! 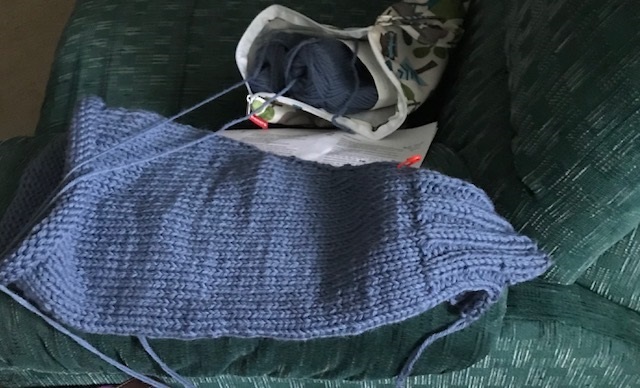 One of the crafty podcasts I have recently started watching regularly on YouTube is Stitching the High Notes with OperaJo (her Ravelry name) – an opera singer (I suspect a soprano), fundraiser, and all-around crafter from the San Francisco Bay area in California. Joanna is a knitter and sewer and also cross stitches among many other things I am sure. Viewing her beautiful stitching projects had me resurrecting some of my own. I started these babies in the mid 1980s! I still rather like them. Both are kits from Cadle Creek Heirloom Series. I looked for more of them online, but could only find one or two for sale on Ebay. Assume they are no longer in business. If anyone out there knows, please let me know. I really liked this series and still do. The top one you see here was started in anticipation of my first year of law school. 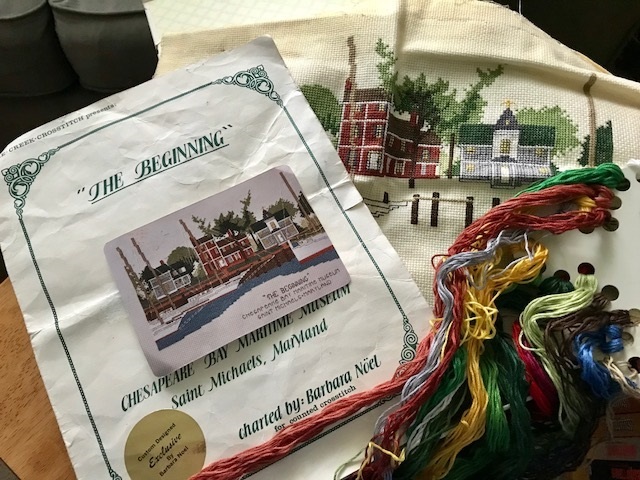 I bought it at a local craft store in St. Michaels, MD when we lived there in 1986-1987. This one I bought at the St. Michaels Maritime Museum a couple of months before we moved there in 1986. I was happy to see that the materials were still in fairly good shape – yay DMC:)! The only bad thing was a rather plasticky smell from the plastic bags in which I had stored them. I suspect that smell will diminish with washing and fresh air. What is surprising to me is how far along I had gotten on these. I do know that in 1987 we moved back to the other side of the Chesapeake Bay Bridge and I began law school shortly thereafter. That, the raising of our six kids, and staying alive took up all my time, so these beauties remained on the shelf. I gave it a try again in 2002, but I had gotten too farsighted for the detail work and put it aside again. 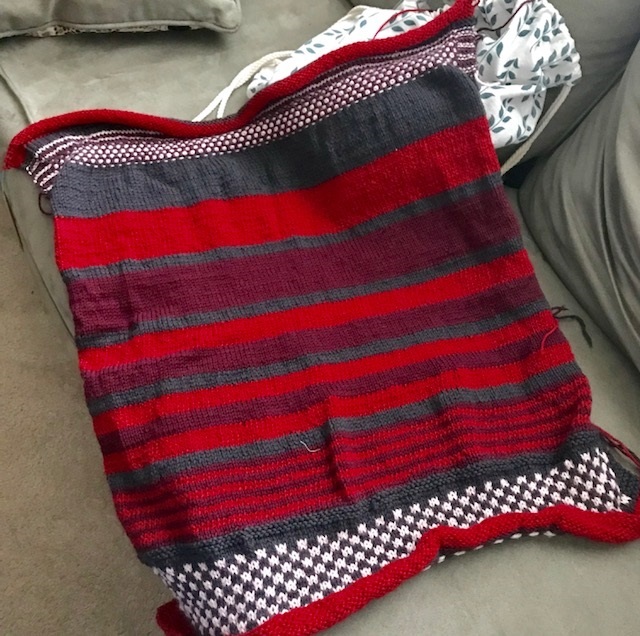 When one of our daughters, S, started cross-stitching some badass samplers, I thought she might want to work on these, but her style is a lot different from mine. For example, there is a small crocheted hoop hanging near the kitchen sink that says, “Dishes are DONE, man!” – a reference to a line in the movie Don’t Tell Mom the Babysitter is Dead. Now THAT’s some cross-stitching! 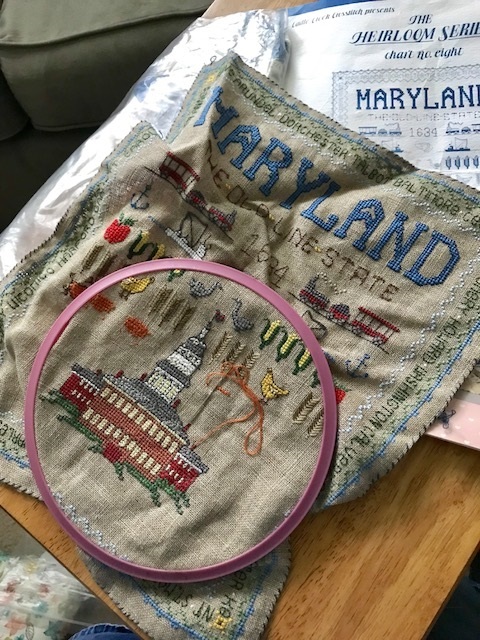 Anyway, I spent an hour or so last night sorting through the floss for the Maritime Museum project and today rescued the Old Line State project from the basement along with some Aida fabric. I think I may just finish these – finally:)! Thirty-two years might be a record for a WIP, don’t you think? 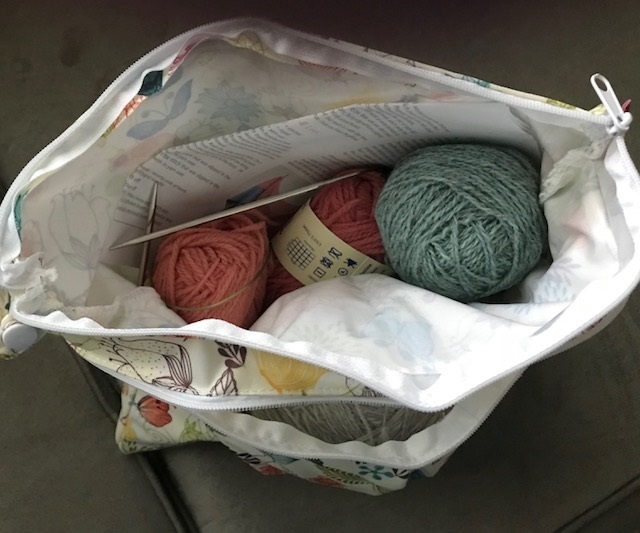 In addition, I bought some floss, needles and Aida cloth for another project at Everything Crossstitch to create another sampler I was admiring in a book I bought a long time ago. HAH – my husband is going to lose his mind when he sees that…. Some progress to report on the Truckbeth Carbeth. First sleeve is DONE, man! It took practically no time at all – don’t know why I procrastinated! No more of those triple stitch thingies!!! Yay!!! I love the colors in this thing. Cannot wait to get it finished! Don’t you love it when a WIP is further along than you thought? I’ve also made some progress on the Nina2 Am now well into the second half. Gotta go – 11 of the 17 are coming for dinner and John is cooking! Which means I get to clean the house and kitchen. I’ll take it!